CGI Studio is Socionext’s 2D/3D software development solution for creating state-of-the-art automotive Human-Machine Interfaces (HMI’s). Created specifically to address the requirements of in-vehicle displays, it enables the user to create innovative HMIs for instrument clusters, infotainment systems, head-up displays and rear-seat entertainment systems. It offers the user a systematic design approach to HMI design management, and the end-product is a solution that meets essential automotive requirements such as fast boot up time, small memory footprint and compliance to ever more stringent automotive standards and safety regulations. In modern vehicle architectures, the capability to operate in a distributed and fully connected environment is essential. CGI Studio offers this capability with broad support for inter-domain communication, real-time operating systems, Linux, and embedded Hypervisors. Vehicle manufacturers today also need to meet the requirements of safety standards such as ISO26262, and the Automotive Safety Integrity Levels (ASIL) A-D. 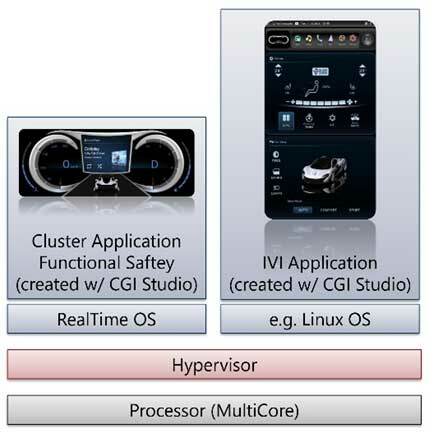 In partnership with embedded software components from Mentor Graphics, the CGI Studio solution supports a mixed-criticality approach to safety, such that essential graphical warnings from vehicle functions can be managed and displayed independently from more complex 2D and 3D graphics on the same HMI. Mentor and Socionext have created single and multiscreen display solutions, that allow “safety-critical” and “normal world” to be combined, but handled separately at the operating system level to ensure safety and security constraints are met. Using this approach, information from Infotainment systems, driver information, navigation and safety-critical vehicle systems warnings can be combined and displayed as needed in center-stack, head-up or rear-seat displays. Graphical content can be moved by from one virtual-machine (VM) domain to another by touch gestures, or “swipes”. Graphical assets such as 3D models, 2D images, animations and other content can be stored on different VMs and easily transferred or distributed as needed. This capability is combined with fast start-up times, with best-in-class rendering performance, typically exceeding 60 Frames-per-Second (60 FPS). The Hypervisor can be configured to support GPU and other available hardware resource sharing between the different domains. SESA will present its innovative product range including the Hypervisor Demo from March, 22-24, 2017 at China International Automotive Electronics Technology Expo in Chongqing/ China. Meet us at the Socionext booth in Hall N3, booth T12. Mentor Graphics Corporation (NASDAQ: MENT) is a world leader in electronic hardware and software design solutions, providing products, consulting services and award-winning support for the world’s most successful electronic, semiconductor and systems companies. Established in 1981, the company reported revenues in the last fiscal year of approximately $1.18 billion. Corporate headquarters are located at 8005 S.W. Boeckman Road, Wilsonville, Oregon 97070-7777. For more information, visit www.mentor.com. Socionext Embedded Software Austria GmbH in Linz (SESA) is a leading HMI tool provider and development partner for worldwide automotive, industrial, and telecommunication customers. SESA supports its customers with the CGI Studio tool environment as well as provision of software services mainly in the areas of HMI development and embedded software. SESA’s activities are driven by its close customer relationships and strong concentration on customers’ needs. For more information, visit www.cgistudio.at. Socionext is a new, innovative enterprise that designs, develops and delivers System-on-Chip products to customers worldwide. The company is focused on imaging, networking and other dynamic technologies that drive today’s leading-edge applications. Socionext combines world-class expertise, experience, and an extensive IP portfolio to provide exceptional solutions and ensure a better quality of experience for customers. Founded in 2015, Socionext Inc. is headquartered in Yokohama, and has offices in Japan, Asia, United States and Europe to lead its product development and sales activities. For more information, visit www.socionext.com.